Oʻahu (pronounced [oˈʔɐhu], anglicized Oahu /oʊˈɑːhuː/), known as "The Gathering Place", is the third-largest of the Hawaiian Islands. It is home to roughly one million people—about two-thirds of the population of the U.S. state of Hawaiʻi. The state capital, Honolulu, is on Oʻahu's southeast coast. 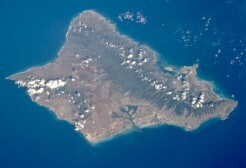 Including small associated islands such as Ford Island and the islands in Kāneʻohe Bay and off the eastern (windward) coast, its area is 596.7 square miles (1,545.4 km2), making it the 20th-largest island in the United States. Oʻahu is 44 miles (71 km) long and 30 miles (48 km) across. Its shoreline is 227 miles (365 km) long. The island is composed of two separate shield volcanoes: the Waiʻanae and Koʻolau Ranges, with a broad "valley" or saddle (the central Oʻahu Plain) between them. The highest point is Kaʻala in the Waiʻanae Range, rising to 4,003 feet (1,220 m) above sea level. The island was home to 953,207 people in 2010 (approximately 72% of the population of the state, with approximately 81% of those living in or near the Honolulu urban area). Oʻahu has for a long time been known as the "Gathering Place". The term Oʻahu has no confirmed meaning in Hawaiʻian, other than that of the place itself. Ancient Hawaiian tradition attributes the name's origin in the legend of Hawaiʻiloa, the Polynesian navigator credited with discovery of the Hawaiian Islands. The story relates that he named the island after his son. Residents of Oʻahu refer to themselves as "locals" (as done throughout Hawaiʻi), no matter their ancestry. The city of Honolulu—largest city, state capital, and main deepwater marine port for the State of Hawaiʻi—is located here. 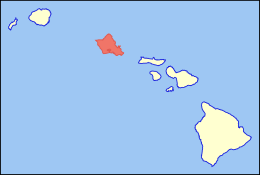 As a jurisdictional unit, the entire island of Oʻahu is in the Honolulu County, although as a place name, Honolulu occupies only a portion of the southeast end of the island. 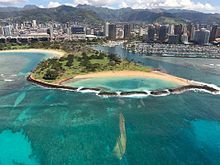 Well-known features found on Oʻahu include Waikīkī, Pearl Harbor, Diamond Head, Hanauma, Kāneʻohe Bay, Kailua Bay, North Shore. While the entire island is officially the City and County of Honolulu, locals identify settlements using town names (generally those of the census-designated places, and consider the island to be divided into various areas, which may overlap. The most commonly accepted areas are the "City", "Town" or "Town side", which is the urbanized area from Halawa to the area below Diamond Head (residents of the island north of the Koʻolau Mountains consider the Town Side to be the entire southern half), "West Oʻahu", which goes from Pearl Harbor to Kapolei, ʻEwa and may include the Mākaha and Waiʻanae areas; the "North Shore" (northwestern coast); the "Windward Side" (northeastern coast from Kahuku to Kāneʻohe); the "East Side" or "East Coast" (the eastern portion of the island, from Kāneʻohe on the northeast, around the tip of the island to include much of the area east of Diamond Head); and "The Valley" or "Central Oʻahu" which runs northwest from Pearl Harbor toward Haleʻiwa. These terms are somewhat flexible, depending on the area in which the user lives, and are used in a mostly general way, but residents of each area identify strongly with their part of the island, especially those outside of widely-known towns. For instance, if locals are asked where they live, they would usually reply "Windward Oʻahu" rather than "Lāʻie". Being roughly diamond-shaped, surrounded by ocean and divided by mountain ranges, directions on Oʻahu are not generally described with the compass directions found throughout the world. Locals instead use directions originally using Honolulu as the central point. To go ʻewa means traveling toward the western tip of the island, "Diamond Head" is toward the eastern tip, mauka is inland (toward the central Koʻolau Mountain range, north of Honolulu) and makai toward the sea. When these directions became common, Diamond Head was the eastern edge of the primary populated area. Today, with a much larger populace and extensive development, the mountain itself is often not actually to the east when directions are given, and is not to be used as a literal point of reference—to go "Diamond Head" is to go to the east from anywhere on the island. Oʻahu is also known for having the longest rain shower in history, which lasted for 200 consecutive days. Kāneʻohe Ranch, Oʻahu, Hawaiʻi reported 247 straight days with rain from August 27, 1993 to April 30, 1994. The island has many nicknames one of them being "rainbow state." This is because rainbows are a common sight in Hawaiʻi due to the frequent rain showers. The average temperature in Oʻahu is around 70–85 °F (21–29 °C) and the island is the warmest in June through October. The weather during the winter is cooler, but still warm with an average temperature of 68–78 °F (20–26 °C). The windward side is known for some of the most beautiful beaches in the world. Lanikai Beach on the windward coast of Oʻahu has been consistently ranked among the best beaches in the world. The island has been inhabited since at least 3rd century A.D. The 304-year-old Kingdom of Oʻahu was once ruled by the most ancient aliʻi in all of the Hawaiian Islands. The first great king of Oʻahu was Maʻilikūkahi, the lawmaker, who was followed by many generation of monarchs. Kualiʻi was the first of the warlike kings and so were his sons. In 1773, the throne fell upon Kahahana, the son of Elani of Ewa. In 1783, Kahekili II, King of Maui, conquered Oʻahu and deposed the reigning family and then made his son, Kalanikūpule, king of Oʻahu. Kamehameha the Great would conquer in the mountain Kalanikūpule's force in the Battle of Nuʻuanu. Kamehameha founded the Kingdom of Hawaiʻi with the conquest of Oʻahu in 1795. Hawaiʻi would not be unified until the islands of Kauaʻi and Niʻihau surrendered under King Kaumualiʻi in 1810. Kamehameha III moved his capital from Lāhainā, Maui to Honolulu, Oʻahu in 1845. ʻIolani Palace, built later by other members of the royal family, is still standing, and is the only royal palace on American soil. Oʻahu was apparently the first of the Hawaiian Islands sighted by the crew of HMS Resolution on January 19, 1778, during Captain James Cook's third Pacific expedition. Escorted by HMS Discovery, the expedition was surprised to find high islands this far north in the central Pacific. Oʻahu was not actually visited by Europeans until February 28, 1779, when Captain Charles Clerke aboard HMS Resolution stepped ashore at Waimea Bay. Clerke had taken command of the ship after James Cook was killed at Kealakekua Bay (island of Hawaiʻi) on February 14, and was leaving the islands for the North Pacific. With the discovery of the Hawaiian Islands came the introduction of disease, mosquitoes, and aggressive foreign animals. Although indirect, the simple exposure to these foreign species caused permanent damage to the Native Hawaiian people and environment. The Imperial Japanese Navy's attack on Pearl Harbor, Oʻahu on the morning of December 7, 1941 brought the United States into World War II. The surprise attack was aimed at the Pacific Fleet of the United States Navy and its defending Army Air Forces and Marine Air Forces. The attack damaged or destroyed twelve American warships, destroyed 188 aircraft, and resulted in the deaths of 2,335 American servicemen and 68 civilians (of those, 1,177 were the result of the destruction of the USS Arizona alone). Today, Oʻahu has become a tourism and shopping haven. Over five million visitors (mainly from the contiguous United States and Japan) flock there every year to enjoy the island. Oʻahu boasts of having had the Olympic Gold Medal winner Duke Kahanamoku serve as Sheriff, perhaps the only such athlete to serve as a law enforcement professional. He held that office for 13 consecutive terms, from 1932 until 1961. Visitors should be aware that some of the police vehicles on Oʻahu (and on the "Big Island" of Hawaiʻi) are unmarked except for the blue lights mounted on their roofs. Waikīkī Beach is one of the most known beaches in the world. Jellyfish swim in a tank at Waikīkī Aquarium. National Memorial Cemetery of the Pacific or "Punchbowl"
In the video games Test Drive Unlimited and Test Drive Unlimited 2 players can drive around O'ahu island's 1,000 miles (1,600 km) of road. Some aircraft can be flown over Oʻahu as it appeared during the later years of World War II in the online multiplayer combat flight simulator War Thunder. Most American aircraft can be flown from the Pearl Harbor airstrip in the game's Test Flight mode. Microsoft Flight, released in 2012 as the successor to the Microsoft Flight Simulator series, was set on island of Hawaiʻi. The game had a piece of downloadable content (DLC) called Hawaiian Adventure Pack. Once purchased, it brought detail to all of the Hawaiian islands to the game, including Oʻahu. The DLC also brought new airports to land and take off from and new missions to complete, among other things. In Pokémon Sun and Moon, Melemele Island is based on Oʻahu. The novel From Here to Eternity (1951) and the film and television series based on it all end with the December 7, 1941 attack on Pearl Harbor. Michael Crichton's posthumous techno-thriller novel, Micro, is set in the island of Oʻahu. Boyd Morrison's book The Tsunami Countdown is set on Oʻahu. Alan Brennert's book Honolulu tells the fictional tale of Korean girls who came to Oʻahu in the early part of the 20th century and includes accurate Hawaiian history. Kirby Wright's book The Queen of Moloka'i Book 1: Based On a True Story is set in part in the Oahu neighborhood of Kaimuki during the Roaring Twenties. Lost was filmed almost entirely on Oʻahu, with many locations on the island (predominantly Honolulu) serving as a stand-in for other locations (including United States, Australia, United Kingdom, and South Korea). Many of the show's stars still call the island home. The island's thick rainforests and picturesque beaches are prominently featured. The Reimanns, a popular German reality TV series, has been filmed on the North Shore at the family's estate in Pūpūkea since December 2015. Beginning with a contract with the US Navy in 2001, Ocean Power Technologies began ocean-testing Azura, its wave power generation system at the Marine Corps Base Hawaii (MCBH) at Kāneʻohe Bay. The Oʻahu system was launched under the company's program with the US Navy for ocean testing and demonstration of such systems, including connection to the Oahu grid. The prototype can produce 20 kW, a system with 500 kW to 1 MW is planned to be installed at end of 2017. Oʻahu has 343 MW of rooftop solar power, and potential for 92 MW of wind power. ^ "Table 5.08 – Land Area of Islands: 2000" (PDF). State of Hawaii. 2004. Retrieved July 23, 2007. ^ "Table 5.11 – Elevations of Major Summits" (PDF). State of Hawaii. 2004. Retrieved July 23, 2007. ^ Boeing, G. (2016). "Honolulu Rail Transit: International Lessons in Linking Form, Design, and Transportation". Planext. 2: 28–47. Retrieved April 29, 2016. ^ Conners, Valerie. "Top 10 Beaches of Hawaii". Travel Channel. Retrieved December 12, 2016. ^ Van, James (2010). Ancient Sites of Oahu: A Guide to Archaeological Places of Interest. Bishop Museum Pr. Page 5. ISBN 978-1581780956. ^ "Test Drive Unlimited 2 trailer shows pretty sights of Ibiza, Oahu". Neoseeker. ^ "MythBusters: Duct Tape Island Aftershow : Video : Discovery Channel". Dsc.discovery.com. March 25, 2012. Retrieved August 6, 2013. ^ Father and Me Hawaii Tourism Authority 2016. Retrieved 14 June 2017. ^ The Reimanns TV episode guide. Retrieved 14 June 2017. ^ "Ocean Power Technologies: Capturing Wave Energy for the U.S. Navy and the Grid" (PDF). Acore.org. American Council on Renewable Energy. Archived from the original (PDF) on September 8, 2015. Retrieved May 18, 2015. ^ "Azura connects in Hawaii". reNEWS – Renewable Energy News. ^ "Solar Energy". Hawaiian Electric. Retrieved January 9, 2017. ^ "High Resolution Wind Resource Maps". Hawaiian Electric. Retrieved January 9, 2017. Macdonald, Gordon A., Agatin T. Abbott, and Frank L. Peterson. 1983. Volcanoes in the Sea. University of Hawaiʻi Press, Honolulu. 517 pp. Pukui, M. K., S. H. Elbert, and E. T. Mookini. 1976. Place names of Hawaiʻi. University of Hawaiʻi Press. 289 pp. This page was last edited on 14 April 2019, at 20:28 (UTC).